First commenter to recognise the artists signature gets a free…. uh… virtual cookie. So you know in other words. Nothing! Let’s hear it for Kris Kristofferson, everybody! Lion-o regretted buying second hand Glo-sticks. I like the fact Lion-o here has a bit of a beer belly straining at his shirt. Lion-o and Wednesday Adams. I’ve seen worse pairings. Is that Lars Ulrich in the background? Why looks he so melty? Not necessarily in a good way. I’ll never forget having kidney stones, but that doesn’t mean I’d like to have ’em again. What are the odds that both of them would get hit in the left sides of their faces with shovels? Dorian La Padura? He seems to be old enough, though now he is a fine artist and colour consultant. Difficult to find anything about him except for a few abstracty paintings and a violently yellow door for which he suggested the colour. He did illustrate a Philip Roth story in Penthouse in 1977. It’s hard to believe … but this is better than the first edition cover art. I like the hayseed lion look better than the whatever it is behind broken bars dealy. @Pat: I suspect your identification of the artist as Dorian La Padura is correct, for all that his current work is very abstract. 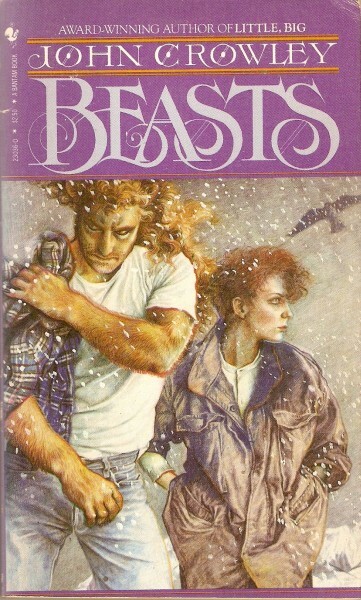 @Alessandra: that is a fine cover. My eye wanders naturally around the lion, and the lines that lie on it liven it likewise. Alternate ending to Beverly Hills 90210. Shannon Doherty and Luke Perry. With a sense of gloomy foreboding, Leo flicked his Giant-Size Flame-O-Fast gas lighter… and nothing happened. And he knew from the look on his wife’s face that the furry barbeque had been ruined. On, it’s a rifle. I thought it was one of those things you could use to force the ignition on a Saab. Yoss: Depends on what part of town they’re in. 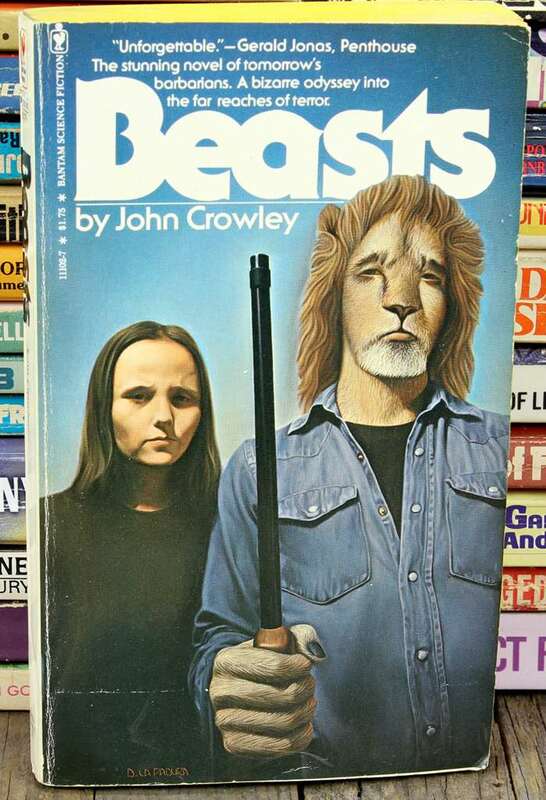 The woman looks kind of like a middle-aged Jenna Coleman. Lion Man looks fine. @Anna T.: Leo is actually Matt Smith without make-up. I wonder if he has ever had any other hairstyle besides the built in mullet. They were right. They said gay marriage would lead to something like this. Ah hear tell you said “The Lion King” ain’t such a good pitcher. 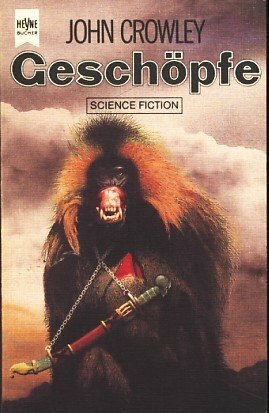 I distinctly remember an SFBC cover which was NOT the one given in the Wiki article, but it’s also not on ISFDB (though we know their standards, eh?). It was mostly a white background with a simple line drawing of a lion face behind broken bars. I don’t have it any more to check. But it sure beat this one and several of the others. German cover… ach du lieber! Lion’s become an ape! Dutch cover might need Space Sheep. of negativity directed towards this piece. Or well painted is hampered. It’s easy to bully, and not so easy to sit at an easel for weeks trying to bring life to oil paint with hand to eye coordination and great patience. Greetings Mr Padura and welcome to our site. You misunderstand what we do here. The artwork here is (for the most part) excellent and your talent is to be admired. We make jokes at the subject matter. Not the talent. Don’t take it to heart, Mr La Padura – we’re just arseing about. And if nothing else, this site makes for industrial strength arseing about. Mr La Padura, I too can appreciate the talent and artistic skill needed to sit at an easel for weeks creating a painting. Since I cannot do what you do I am always curious about the mechanics of the craft. Please tell me, how difficult was it to get the lion-man to wear clothes and sit for his portrait? @Bibliomancer—Your comment brilliantly illuminates the fine, fuzzy line between “arseing about” and incisive critical analysis. GSS! @B. Chiclitz – Thank you. Remember, always #BeBest! @BC – Ha Ha GSS! I suppose the cover models from last Thursday misread that as #BeBreast. What makes it look off is the near-photorealistic lady on the left. She’s got shadows aplenty, he does not. @Monty: yes, that’s so. Besides his own key light, he also apparently has a hairdresser (groomer?) and a good supply of hairspray.